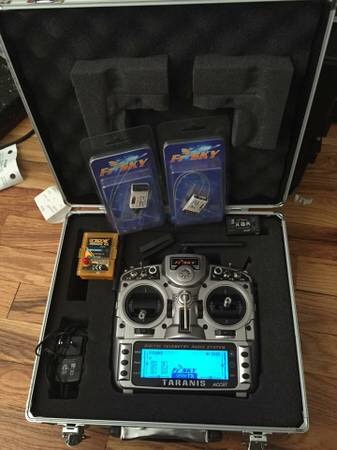 I have a FrSky Taranis X9D RC transmitter. Everything is practically new. I bought it from a guy who only used it a couple times and I haven't used it because I would spend to much time playing with it instead of my airplanes. It uses an open source operating system and can be customized beyond belief. I has 16 channels but can be modified through software to have up to 32. This radio is used by a lot of quadcopter and FPV hobbyist because of it's versatility. It has voice feedback and vibration feedback. So yes, it even talks to you. It can even play music if you want it too. It can accept plug in modules that will allow it to transmit long range and work with different FPV systems. This radio is just too much for what I want to do. I don't need all the bells and whistles. It comes with a custom hardshell case. All the foam is cut out perfect to protect the radio. It comes with a X8R 8 channel receiver w/ Telemetry which allows you to monitor all kinds of vitals while your plane is in the air. It comes with two V8R7-II 8 channel receivers. It also comes with an Orange RX DSMX/DSM2 Module that plugs into the back of the radio to allow you to connect to any Spektrum or DSMX/DSM2 receivers. That's $100 worth of extras!! The system is too much for me. I just want to bind then fly.